On Friday (September 25, 2015) I went from not knowing a brewery was opening soon in Pitt Meadows to standing in their under construction brewery in less than 3 hours. Sometimes social media and dumb luck come together wonderfully! Foamers’ Folly Brewing may have been flying under the radar but no longer. The lounge is still heavily under construction at this point but while I was there the tap lines were being installed. They have 20 Taps likely with 20 beer and one for CO2 with 8 Growler fillers on the other side of the bar. Having the one CO2 tap will mean they could also fill beer that are not on the filling station. The brewery will also have a patio to be installed and ready for summer time next year (no point building it for the winter). One nice touch with this brewery is the fact that the entire space including the brewery and mezzanine upstairs have been approved to be licensed as a lounge. There will only be tables in the lounge proper but you will be able to move around freely. If you look up while getting a grower fill you will also see a stack of 6 horizontal bright tanks suspended above you! This is above the growler station! This brewery will be very unique when it opens up. They do not have one brew house but two with two different sets of fermenters to go along with them. Walking up onto the brew house platform you are met with one 500L system with a larger 2000L system beside it! The 500L system is designed to do double batches to fill 1000L fermenters while the 2000L system is similarly designed to fill 4000L tanks in two brews. They have done this to reduce downtime while brewing as they can have two different beer on the go at any one time. Another neat system they have for doing interesting one offs like single hop beers is a small mobile system with a duel step 4-100L tank system (4 Kettles and 4 Fermentors for a total of 8 tanks) so they can fill them on the brewery floor then move them back upstairs to ferment while still being attached to the breweries glycol chilling system. This way they can make a base beer in the 500L brew house and make 4 distinct beer out of one base beer. This will make test batches very easily scaleable as they use the same carefully temperature controlled system. To help maximize space the brewery decided to go with horizontally stacked bright tanks. You can see in the one photo that the cooler is still under construction. On the mezzanine is where the grain mill, grain (well it will be) and glycol system are housed as well as the batch of bright tanks that you can see from the growler bar. They also have a nitrogen system so they can pour nitro beers! Hidden up here was also a bottling machine! When I was there they had just received their first batch of growlers and were loading them up on the second floor for temporary storage. The brewery has three brewers but none will be considered a head brewer or assistant brewer. The plan is to always have two of the three brewing on brew days minimum. They hope this will help bring creativity to the brewery as they can all brain storm as equals. They will not have beer ready for consumption until they open up in November but I was lucky enough to be able to take home the first one out of their first batch! The 1L bottles look sharp. November is coming very soon so Pitt Meadows better start getting excited! 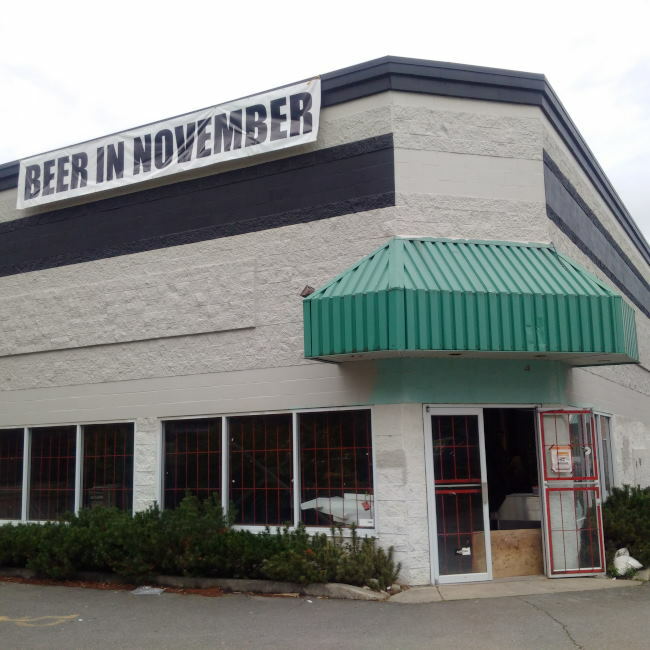 This entry was posted in Brewery and tagged beer, brewery, canada, construction, construction update, craft beer, craft brewery, foamers' folly brewing co, fraser valley, pitt meadows, under construction. I can’t wait to try your craft beers. I am really excited that you are just down the road from me. When can we expect to be able to purchase beer and buy growlers?